On countenance alone one could easily mistake Karl Antao for a gruff, highly disciplined, military type personality. His twirling moustaches, which could send Hercule Poirot in a tizzy, give an impression that is far from the truth. Mild mannered and extremely sensitive, his art is the best medium for recognising both his genius as well as his true persona. Born in 1966, Karl grew up and received all his academic education in Mumbai. He resides in Ahmedabad presently, but has a close connection with Goa. He tells the romantic story of how his Hindu grandfather fell in love with his Catholic grandmother and decided to stay on in Goa, even converting to Catholicism. For that very reason Goa remains close to his heart. Karl Antao is the alumnus of J.J. Institute of Applied Arts. Pursuing an artistic course seemed the most natural thing to do as Karl was drawn to painting and drawing right from his school days. He obtained his BFA in Applied Arts in 1991. Unlike many others, Karl opted to engage his artistic talent while he was studying. He worked as a graphic designer, set designer and visualizer during this period and was immediately picked up by Lintas advertising agency after he graduated. At Lintas he distinguished himself by winning the Lintas Worldwide Silver Medal for Best Campaign for Newstrack, India’s first video news magazine. After a year’s stint at Lintas, Karl began working at the Kanoria Centre for the Arts. He rented a studio and began indulging his childhood fascination with papier maché art. He soon began his affair with wood sculpting, as he says in his own words, ‘Wood chose me!’ He found that he enjoyed working with wood and continued with it. His departure from a secure financial position at Lintas was prompted by his need for artistic expression. He wanted to work on his own terms and the world of advertising is governed by the diktat of the clientele. This proved a hindrance to the exploration of working with something he enjoyed. He believes working on one’s own is a personal journey and you have to take full responsibility for it. Among Karl’s insightful collections there are pieces that stand out to prove his ability to transmute art into a vehicle for a social message. A perfect example is Varaha in the Stars of the Knights from his collection Couple of Differences (2010), which voices his thoughts on the 26/11 Mumbai terror attacks. Borrowing from Hindu mythology, he used Varaha the boar, the avatar assumed by Vishnu to save the Goddess of the Earth (Bhumi Devi). The sculpture sees a man astride Varaha. He represents a soldier as in those soldiers who were willing to lay down their lives to protect the innocent public. 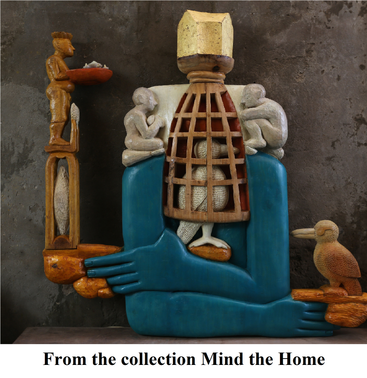 His latest collection entitled Mind the Home puts forth his ideas about the formation of the home in these times, nestled in the product of the human mind that is core values. Karl’s prowess in his field has found confirmation through the numerous awards he has amassed over the years. The Best Sculpture Award bestowed on him by the All India Arts Society in 1992; the Young Emerging Artist of India, Reliance award in 1998 and the Junior Fellow Scholarship, Government of India, 1998, are a few.Karl Antao’s artistic work is not bound to itself in self centeredness and departs from any such image because of his links with various social welfare activities. He has taught clay modelling at a de-addiction centre at Mumbai in 1991. Since 1993 he has been working on and off, alongside Fr. Peter, a family friend, with adivasis, teaching them to make bags of jute, puppets and to work with paper pulp. Here the focus has been on teaching the adivasis a trade to earn their livelihood. Karl has also worked with the deceased Fr Joe. Braganza of St. Xavier's College, Ahmedabad, in introducing slum children to the pleasures of art. The children were exposed to paints, crayons and sheets of paper that are a luxury for them. Karl is all praise for Fr. Joe Braganza's work, saying his own contribution has been minimal compared to the Jesuit priest who dedicated his life to the upliftment of people living in slums. An astute observation he makes based on his experiences is that people who are not educated in the formal way are the most perceptive and intelligent. As regards his art, he says, ‘I’m not trying to teach anybody. It is up to them what they want to learn.’ A man who prefers to work with the present where his art is concerned, Karl Antao has definitely made his mark as an artist with heart.